This is now my favorite marinade for tofu and the peanut sauce is out of this world. Usually satay comes on a skewer but I didn’t have any in the house so I cubed up the tofu anyway and presented it on the rice. Same thing. Press tofu and cut into cubes. Combine marinade ingredients and marinate tofu for as long as you time for. Grill for a few minutes on each side. Slice scallions and place into a pot with the coconut milk. Bring to a boil. Reduce to a simmer and add the rest of the ingredients whisking until the sauce comes together. Make a bed of rice. 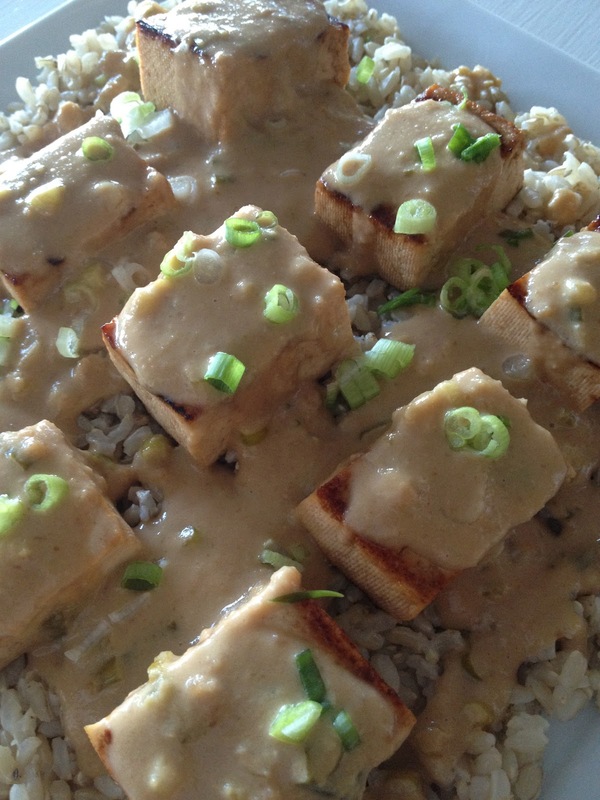 Place tofu on the rice and top with sauce and sliced scallions. Enjoy! thanks karen! it's fun. hope you are having fun cooking too!